There are many interesting occurrences that take place at the Ruthin Gaol located in a relatively historical location in the North area of Wales. This particular castle was constructed in the time of the 13th Century by the popular Edward I. A family with the last name of "Grey" was head over the castle for many, many years. As a matter of fact, their reign over this structure ended in the year of 1646. Located in an area known as "St. Peter's Square", it is believed that the actual construction date is 1404. During this time period, the structure served as a "waiting area" for those that were to face more severe forms of punishment for various crimes committed. Criminals housed in the Gaol included both males and females. Crimes such as vagrancy, various types of misdemeanors, and those that failed to pay fines required by law were often stationed here. The official jail was constructed in the area in the year of 1775. This particular unit was designed by a man by the name of J. Turner. It was created to serve the area in Wales known as "Denbighshire". Many criminals met their fate while staying at the Gaol due to the crimes that they had committed in which they were being detailed for. The last of the many executions that occurred at this particular structure took place in the year of 1903. Prior to this, and immediately following this time period, many strange and unusual events took place in which many state were paranormal based. One of the most popular hauntings that is said to occur at the Ruthin Gaol is related to a man by the name of William Hughes. This individual was held as a criminal and was executed at the location for his crimes in the year of 1903. In the year of 1901, William and his wife experienced many complications when one of their children died. Shortly thereafter, William found that he could no longer bear the agony of being around his family, so he left. In the year of 1902, he was charged with the crime of the time that was referred to as "family desertion". Immediately following his capture, he was sent to Ruthin Gaol for a period of three months. Following his release in the month of November that same year, William was released from the Ruthin Gaol detainment. He located his wife after acquiring a weapon and shot and killed her. Immediately thereafter, he found the police and turned himself in. He did attempt to plea insanity, but the jury did not go for it. They marked him as "guilty" for the case of murder against his wife. The next morning, he was ordered to be hanged at the jail. It is said that he thoughtfully observed a picture that showed his family prior to his death. Since his death, women who have visited the gaol, and those confined to the structure claim that his spirit still lingers the yards and the structure. In all actuality, it is common for women to claim that he is felt. There is a second man by the name of "William" that is also believed to haunt the Ruthin Gaol. This man was named William Kerr. It is said that he was one of the guards that watched over the establishment and the inmates as well. He was not a well-liked guard as he would often make the inmates go without food, he was very strict when it came to the rules of the establishment, and he was often one who would beat the inmates with little to no cause at all. One day, Kerr simply disappeared. No one knew what happened to him, and no one ever heard from him again. Could the spirits of the inmates that passed away prior to his disappearance have driven him to insanity? Could the inmates at Ruthin Gaol captured him and quietly did away with him? No one knows...to this day. 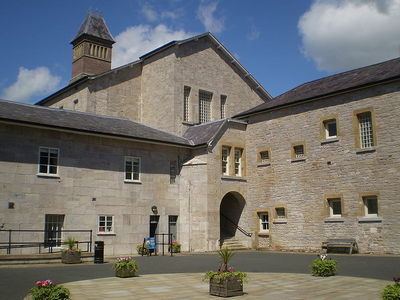 There are many unique hauntings that are said to occur at Ruthin Gaol in the Northern part of Wales. Many paranormal investigators and others who take an interest in the unusual events at the structure state that the spirits of sad, tormented souls still roam in and around this dark structure. If you are interested in haunted places to go, and will be in this area of Wales, this is an experience that you should partake in. It is then that you will be able to decide if this structure is truly haunted, or not.